Thanks to syndication profits, Scrubs is one of those shows that seems to just keep going and going. Could this finally be the end of the road? Scrubs follows hospital life as seen through the eyes of Dr. J.D. Dorian (Zach Braff). After having left Sacred Heart last season, he’s returned to help teach a new crop of med students. The current cast includes Donald Faison, John C. McGinley, Ken Jenkins, Sarah Chalke, Eliza Coupe, Kerry Bishe, Michael Mosley, and Dave Franco. Based simply on the ratings, ABC shouldn’t have been renewed the show last season. 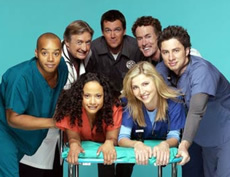 Scrubs had dwindled to an average of just 4.97 million viewers and a low 2.2 rating in the 18-49 demographic. It was saved because ABC’s production studio produces the show and another season would bring more money in syndication. This season, with several members of the cast only popping in occasionally, the ratings have gotten even worse. Thus far, Scrubs has averaged just a 1.6 rating and 3.7 million viewers. That’s bad — like “do not resuscitate” bad. 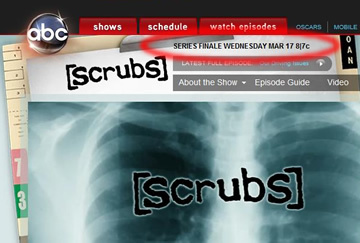 Next week’s episode of Scrubs marks the season finale and is titled “Our Thanks.” Or is it the series finale as the ABC.com website says. It’s possible that it’s just a website error but either way, it seems unthinkable that ABC wouldn’t finally cancel the venerable sitcom. What do you think? Is next week’s really the last episode of Scrubs? Do you think it’s finally time to say goodbye or is there still some life left in it? I LOVE SCRUBS!!!!! its been my favorite show since it started, i hope it comes back but with J.D. and all the old gang for at least one more season. baru aja selese nonton seri terakhir season 8. bagus amat, mengharukan. ending yg akan terus dikenang. tapi ane ude beli dvd full complete season 9, cuma 3 disc. di Jakarta, Indonesia mah murah.semua film bajakan, full episode cuma 15ribu rupiah. 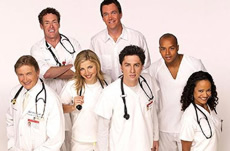 Scrubs is my favorite and the greatest show of all time and i wish that it had not been cancelled and they could come back for one last final season!